Boat Name Gear is a Connecticut company specializing in personalized products for boaters and marine businesses. We began with a goal of helping boaters enjoy the boating lifestyle, even when they are not on the water. The idea was that with custom embroidered clothing and personalized gear displaying your boat name, you can feel like you are on your boat all year round. We have since expanded to serve organizations in marine-related industries, with clients like MarineMax and SeaTow coming on board after meeting us at boat shows or hearing good things about us from their customers. Using top of the line commercial equipment, more than 90% of our embroidery is done in-house by our qualified professional staff in Connecticut - not contracted out to the lowest bidder. Whether we are embroidering a boat name on a single hat or outfitting an entire crew, we take pride in every piece we produce. Boat Name Gear is an active member of our local boating community and CMTA member. 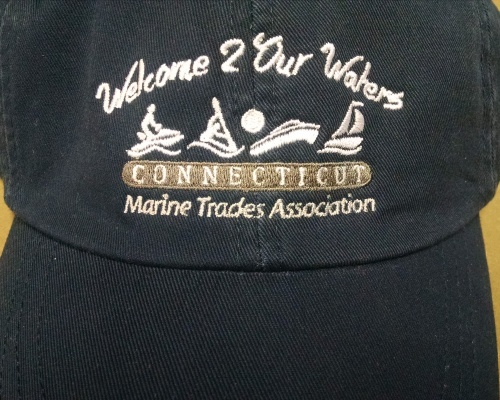 In fact we frequently provide apparel for the Connecticut Marine Trades Association (CMTA) staff and volunteers at the Hartford Boat Show. We do not require minimum quantities on embroidered apparel. We strive to offer high quality products, exceptional service, and quick turn-around times at reasonable prices. Whether you are getting gear for yourself, as a gift, or for your organization, we hope you are satisfied with the products and service you receive from us.